Using AWS Marketplace, Rent-A-Center adopted Alert Logic cloud security as a service to reduce management overhead, simplify regulatory compliance, and gain the freedom to innovate rapidly while protecting data. Rent-A-Center operates more than 3,000 stores in the United States, Mexico, and Canada, offering name-brand furniture, electronics, appliances, and computers through easy, affordable rent-to-own agreements. Rent-A-Center uses Alert Logic from AWS Marketplace for complete protection across its AWS environment, including advanced threat detection, monitoring, and alerting, fully managed 24/7 by security experts. Rent-A-Center offers brand-name, rent-to-own furniture in more than 3,000 stores across the United States, Canada, and Mexico. No-cost repairs and a no-credit path to ownership deliver a unique customer experience. Prior to adopting a cloud-first approach, Rent-A-Center partnered with managed security provider Alert Logic 24/7 security as a service. “Alert Logic is a managed service that identifies which security issues need our attention,” says Sprague. 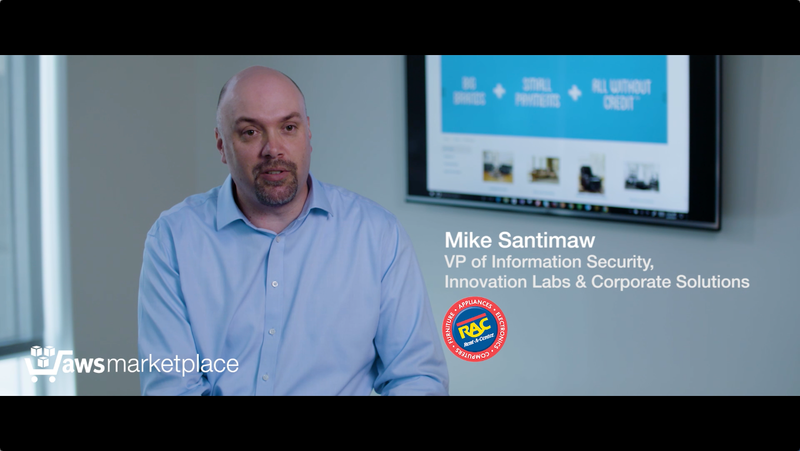 “They ensure that we’re spending our time on issues that matter so we can use our time wisely and manage genuine security issues effectively.” Rent-A-Center wanted to continue getting this high level of security assurance after moving to the cloud. While AWS provided a high level of platform-level security and compliance capabilities, Rent-A-Center wanted to continue using a managed security service to reduce the cost and management overhead of protecting applications, devices, and data, and to minimize risk as it moved to a more agile development approach. Rent-A-Center discovered that Alert Logic was available on AWS through the AWS Marketplace, an online store that helps organizations find, buy, and use software and services on AWS. The company quickly decided to adopt Alert Logic in the cloud based on past positive experiences. Alert Logic on AWS is designed for the cloud, empowering Rent-A-Center with advanced threat analytics, detection, and alerting across its applications and services. Using full-packet inspection within the AWS environment, it uniquely protects against threats that proliferate inside an organization’s cloud environment as well as attacks coming from outside. Learn more about the breadth of cloud solutions available on AWS Marketplace.